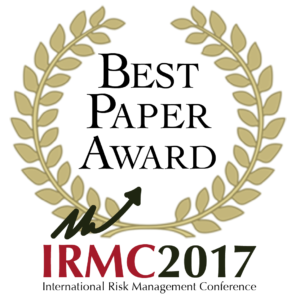 In occasion of the 10th Celebrative Edition RBF and Classis Capital SIM have conferred the IRMC2017 Best Paper Award. The winners have been selected by an Award Review Committee and declared at the Gala dinner, sharing the € 3000 cash prize. For the first time a paper of excellent distinction has been selected for the Best Paper Award. The selection was made by a panel of three members of the Scientific Committee, including Linda Allen, Zvi Wiener and Menachem Brenner, who decided to award Cecilia Caglio – Matt Darst – Eric Parolin for their paper entitled “Half-full or Half-empty? A Direct Test of the Impact of CDS Trading on Corporate Credit Risk”. In this paper the authors test how the CDS position of banks affect underlying CDS reference entity credit risk. The study uses unique supervisory data to match U.S. bank CDS transactions with corporate debt holdings. Their results suggests that credit risk in not adversely affected when banks purchase credit protection. The IRMC2017 Best Paper Award was gently sponsored by Classis Capital SIM SpA. Read below the letter of Maurizio G Esentato, Founding Partner, CEO & CIO of Classis Capital SIM. “I am pleased that this conference has drawn together such a knowledgeable group of academics, practitioners and other experts to address issues of a great significance to financial markets, banking community and regulation. For those who don’t know Classis Capital, let me tell you that we brought to Italy the model of the independent Investor Advisor in a unique fashion. Differently by the majority of players doing our business, our model is centered on research. At Classis we really try to get the most from the world of theorists and practioners. This is a distinction that it is very often made and we have to be aware that economics is perhaps the only science that has both. The financial market crisis has highlighted, in Europe and especially in Italy, structural weaknesses in asset management, in a competitive environment characterized by conflicts of interest. Classis Capital was created to counter and refute these lines of thought, asserting the supremacy of active management and responding to the real needs of the customer (whether companies, individuals, institutions ie. Insurance, pension funds, foundations etc. ), fundamental traits of our strategy they could only combine redefining the business model radically. Classis Capital offers advisory services for financial management in terms of asset allocation and portfolio optimization based on market forecasts and personalized investment recommendations based on fundamental analysis of the underlying (equities / bonds) developed by our investment teams.